With Order Desk, you can connect to any Fulfillment by Amazon (FBA) region to send your orders for fulfillment. The FBA integration has a few limitations and special features that are important to know about. This guide explains what those limitations and features are. When you send an order to FBA, a URL is passed through Amazon's API to pass the order data into Amazon's system. The size of this URL is determined by the amount of data in the order. Amazon’s API has a limit on the size of this URL. What this means is that orders with more than 10 line items may not be accepted by FBA if the URL is too long. To avoid any potential problems, limit line items on a single order to 10 or fewer. The order may need to be split into multiple orders or entered manually at Amazon. For more information on setting up custom alerts in your store, read the guides on working with rules and email templates. FBA sends shipment notifications to your customers. If you want to be CC'd on these emails, you can add your email address to your orders using NotificationEmailCC as checkout data. Set the value as your email address. When sending orders to FBA, the Marketplace ID of the shipping country on the order will be included with the data sent to FBA. 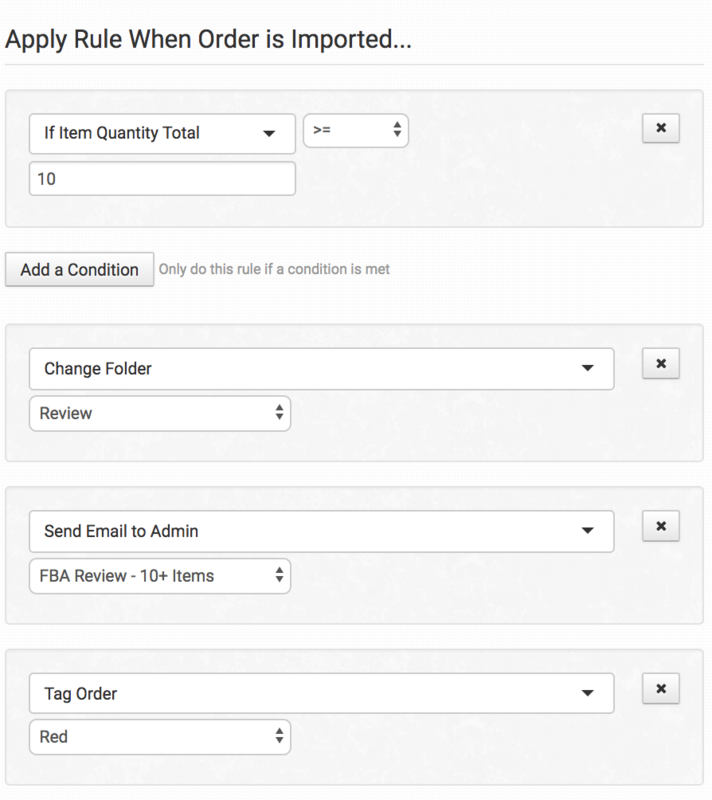 Checkout data can be set manually or automatically on your orders. See the Email Notification CC instructions above for how to set checkout data automatically with a rule. The value of the products in an order is passed through to FBA in the declared value fields so they are in the same currency as the warehouse receiving the order. This may not always be the same currency as the original transaction. This may not be an issue for your store unless your customer will be charged customs fees. If you need to ensure an approximate currency adjustment to account for exchange rate, set a checkout data field called DECLARED_VALUE_MULTIPLIER on the order. The declared value of each line item will be multiplied by this number. If you would like to explicitly set the currency code, set checkout data on the order with a name of DECLARED_VALUE_CURRENCY. 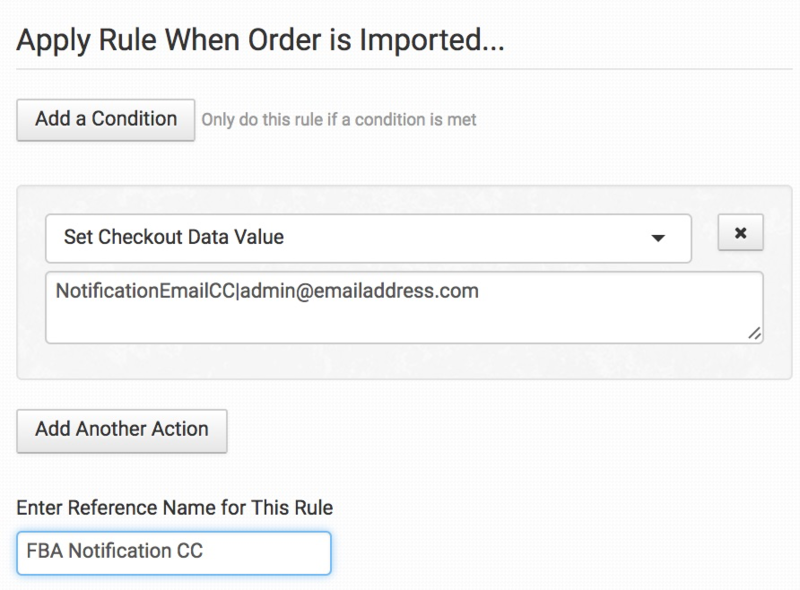 See the Email Notification CC instructions above for how to set checkout data on orders automatically with a rule. Click through to the next guide in the FBA series: Common FBA Errors.